According to the Idaho Transportation Department, motor vehicle fatalities statewide are dropping. There were 40 deaths during the first four months of 2010, compared with 62 over the same period last year. In a yearly look at the situation, highway deaths dropped by 20 from 2007 to 2008. The department says that in 2007 there were 252 deaths, compared to 232 in 2008. And preliminary data for 2009 suggests a continuing drop to 226 fatalities. A Georgia lawyer took on red light cameras- by subpoenaing the actual cameras! She won her case, although the judge says it wasn't because of her strategy. When criticized for the unorthodox move, lawyer Regina Quick said it is 'Orwellian' at best that you can be ticketed by a machine. A reminder that this is a long holiday weekend, so not only will you not have access to government offices on Monday, but there will probably be a four day blogging hiatus for me. I'll be back Tuesday though to dig myself out. - Work will be suspended on all Idaho Transportation Department construction projects statewide by early Friday afternoon. - All government offices and services will be closed on Monday, including KMPO. Thanks to Chris Bosley of the Coeur d'Alene Pedestrian and Bicycle Advisory Committee for sending this gem to me. Starting tomorrow night, drivers will be able to use both lanes in each direction on I-90 through Post Falls. This stretch of freeway has been reduced to one lane in each direction due to bridge rehabilitation work. The eastbound on-ramp at the Appleway Interchange will also be re-opened. The speed limit in this area will be raised to 55 mph. The project includes both east- and westbound bridges from the Washington State Line to Spokane Street in Post Falls. The bridge decks had a 1.5-inch layer of concrete removed off the surface, damaged areas repaired and the bridge decks overlaid with a new concrete surface. The bridge approaches will receive a new asphalt surface and bridge joints also will be repaired. Nighttime paving work will begin Tuesday (June 1), from 8 p.m. to 5 a.m. Lanes will be reduced during paving operations. It's been ten years of clean streets in Coeur d'Alene, thanks to the 'Adopt a Street' program. That's right, it's the tenth birthday of the program that encourages folks to adopt a section of roadway, then keep it clean. 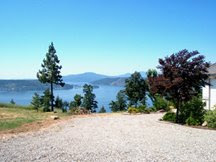 Here's information on that program from the City of Coeur d'Alene Today blog. 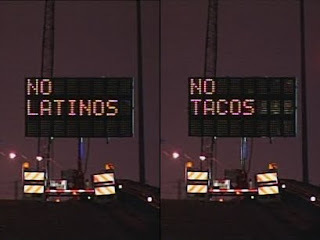 Hackers in Florida used an electronic road sign to fuel the immigration debate yesterday. 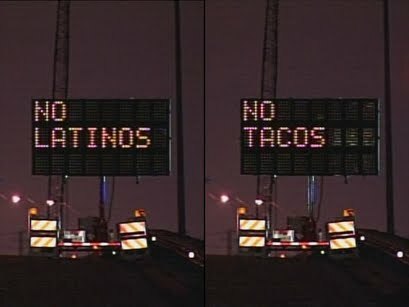 A highway sign flashing "NO LATINOS NO TACOS" greeted drivers on the Palmetto Expressway in Northwest Miami-Dade. NBC Miami has the story. Coeur d’Alene's City Council is getting ready to look at, and possibly approve, the City's 2010 Trails and Bikeways Master Plan next week. The Plan is a road map for how bicyclists can get around town more quickly and safely. The Plan includes adding bike lanes to existing streets, building up north and south running routes for easier commuting, and connecting paths to parks and hiking trail heads for accessibility. More information on it can be found in this Coeur d'Alene Press article. KMPO's Board meeting for June has been cancelled, although I haven't been told why yet. The next KMPO Board meeting is scheduled for July 1. You've only got a week left to use the Appleway Bridge over the Spokane River at Appleway Road and west of Stateline Village. The bridge was built in 1939 and is in poor condition. It will be closed on June 1 to be demolished and rebuilt. This two-year project will take until Spring/Summer 2012 to complete. There's lots more information on this project on the Spokane County website, including a pretty handy detour map and information on a public meeting coming up in June. I'll post those details as we get closer to the meeting date. It's getting to be that time of year again that I call 'construction season.' The good news is that the roads that are closed or obstructed this spring will be nice and smooth and improved when the projects finish up this summer or fall. It can be a minor annoyance getting stuck in traffic, but if you live in Post Falls, there is a way to avoid construction. Here's link to the City of Post Falls website where road closures are posted. Today is the last official day of Bike to Work Week, and a busy week it's been. Tomorrow is the "Finish Line" wrap-up celebration at the Community Garden on Foster and 10th street at 1:00pm. There will be prizes and trophies for participating area businesses for encouraging their employees to Bike to work. 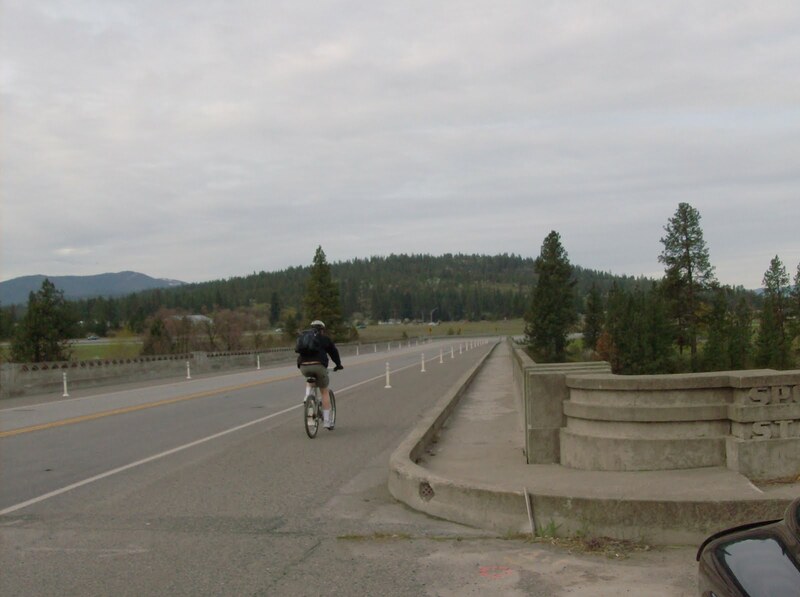 While you wait for that event tomorrow, Here's a look at some of the BTWW events that went on this week, from the Coeur d'Alene Pedestrian and Bicycle blog. There's also an item on there you may want to take note of; the Parks and Recreation Commission sent the 15th Street Bike Lane issue forward to Public Works this week. The City is considering some changes on 15th Street from Sherman Avenue to Interstate 90, including adding bike lanes to both sides of the street. To put in the lanes, the city would re-center and re-stripe the median, and remove all parking on the east side of the street. Public Works meets next Monday, the 24th at 4:00 pm in the Community Room at the Library. This committee will determine whether there is enough support to send it forward to Council. If you would or would not like to see bike lanes on 15th street, come to the meeting and voice your opinion. 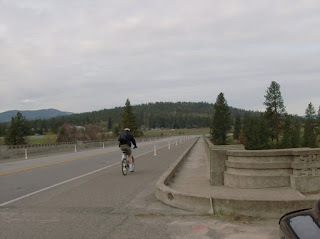 If you haven't been over to the Coeur d'Alene Pedestrian and Bicycle Blog in a while, check it out again. It's got a brand new look. And a 'Bicycle Commuters Calorie Counter.' According to the calculator, on my approximately ten mile bike ride last night, I burned 430 calories, saved $6.66 by not driving, and saved the earth 12.1 lbs of toxic emissions. Holy cow, I feel good about myself! So run your own numbers and let me know how great you are. What are your big plans for the Memorial Day weekend? If AAA is right, you'll probably be on the road somewhere. AAA says more Americans will hit the highways and airports over the Memorial Day holiday weekend, but they’ll probably spend much less than last year. The travel group released a forecast today that projects about 32 million people will go on trips during the final weekend in May. That’s an increase of 5.4% from last year. Most will travel by car, even though gas costs about 50 cents more per gallon than it did a year ago. AAA says travelers will spend much less than last year. Median spending on travel is expected to be $809 this Memorial Day. Last year, Americans reported spending about $1052 for the same weekend. Are you one of the people who will be travelling over the holiday weekend? If not, why not? Is it because of gas prices or other expenses or do you just not have anywhere pressing to go? I rode about 10 miles to my boot camp exercise class last night. Yes, I want to get in shape but no, I shouldn't have tried to do it all in one day. That picture is pretty accurate, only I'm not a man. Can someone come hold my head up while I type? Watch Out For Mr. Whiskers! Ever wonder how many road kill deaths there are per year? I don't either but I'm going to tell you anyway. There are approximately 5.4 million cats killed per year in the U.S. by vehicles and about 1.2 million dogs. Then there are millions of other animals such as rabbits, birds, turtles and something that a friend swore was a monkey in the middle of Perry Street a couple years ago. Did you know that the reason there are so many opposums killed is because they feast on other road kill, making themselves a target in the process? If you're not thoroughly grossed out yet and want to know more stats and 'fun facts' regarding road kill, here's a link to Animal People Online. Hmmm... here's something I didn't know: Kootenai County had the highest rate for car thefts in Idaho in 2009. Nearly three cars are stolen per day in Kootenai County. Why is this? This Coeur d'Alene Press article has the answer. It's finally Bike to Work Week and there's lots going on to mark the occasion. The KMPO/SRTC team is the 'Cranky Bureaucrats' and we plan to rack up lots of miles this year. So bring it on other transportation agencies; challenge us. - A bicyclie scavenger hunt-type event happens on Saturday, May 22nd from 10am to 12pm. - "Finish Line" wrap-up celebration for Bike To Work Week at the Community Garden on Foster and 10th street at 1:00 pm on Saturday, May 22. More information on all these events can be found on the Coeur d'Alene Parks Department website by clicking here. Idaho has filed its response to a motion made by fired Idaho Transportation Director Pam Lowe’s. Lowe was asking for a federal court to rule in her favor on most of her key claims in her wrongful-firing case without holding further hearings. ITD's response? Ummm no. Only it took a 23 page memo to say that. Here's the story from the Spokesman-Review. Who Needs The Force When You've Got Tom Tom? Blogger Holly challenged me to write this thread all in Yoda-speak but I'm going to save you the pain of having to read that and do it in my usual style. I'm fairly un-trendy (I know- not a word) when it comes to purchasing gadgets. Because of this, I have resisted buying a GPS unit. That may change though because Star Wars voices are now available for Tom Tom devices. That's right- Han Solo can direct you to the Quickie Mart to get a slurpy or C-3PO can give you directions to the nearest gun shop. And the coupe de gras is that Lord Vader himself can walk you through how to get to your new gym. Speaking of Darth, here's a behind-the-scenes look at his recording session for Tom Tom. I'm not sure the sound man is still with us. So where do you get your Star Wars Tom Tom voice? You can listen to voice samples and purchase voices here for $12.95. I don't have time to do this story justice today, so I thought I'd put a 'tease' or 'preview' on here as we used to call them in the news business. So, as long as everything goes as planned on Monday, you have Darth Vader giving driving directions to look forward to. Check back, it WILL be worth your time. Which Way Will Gas Prices Go? Every year at this time, as people gear up for holiday weekend and vacation road trips, gas prices seem to climb. This year though, economists say prices will go the other way- down. Here's an article from Magicvalley.com that says many people think gas prices have peaked. At least for a while. I have to admit it- I'm not big on bike helmets. I still wear one of course but they're not the most stylish item. If I had one like this though, I would wear my bike helmet all the time. Even at work. Or there's this stylish option for the men- and lots more. 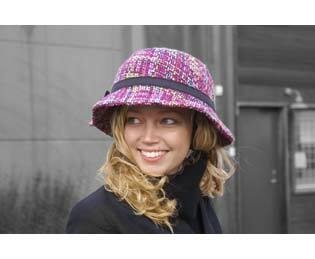 YAKKAY is a brand of bike helmets that can be fitted with any of a range of stylish covers in different colors and fabrics. They're not cheap though- they go for about $145 American, plus $22 for shipping and you can buy an extra 'cover' for $57. Maybe I'll just try making my own at home with a $20 Walmart helmet and a Goodwill hat. For those of you who aren't government workers and can afford this however, here's a link to the YAKKAY website so you can look at all the cool options available. Rathdrum is a step closer to eliminating one form of noise pollution. The City Council agreed to move forward on an agreement with BNSF Railway for a safety improvement that will make train whistles no longer necessary. It's An ITD Mini Film Festival! Grab the popcorn 'cause it's movie time. I was digging around on the Idaho Transportation Department website and found their ITD in Motion page, featuring videos of all kinds. The current options available are 'Work Zone Safety,' 'Rumble Strips,' 'Dangerous Roads,' and several others. I recommend Rumble Strips as it's a solid piece of work. I'll let you choose though. Get on their and watch some videos! So anyone know what those items in the picture are? Okay, done waiting for you to guess. Those are lights that were taken out of the traffic signals in Olympia when they moved to LED signals. I threw my flip flop in to give you an idea how big those bad boys are. And I wear a size 10 if that helps. So why do I have these? 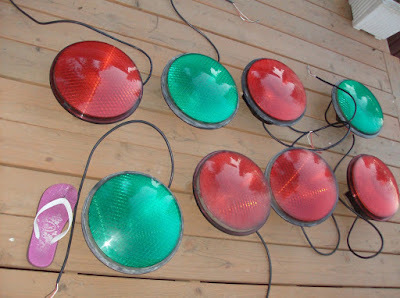 A friend picked them up at the State Surplus Store (which is a wonderful place by the way)- for $1 each!! Now we have ten of them in our possession. Problem is, we're not sure what to do with them. So maybe you can help. Got any ideas for them? Maybe some modern art installation or making them into a chandelier or sculpture. I'm open to any suggestions you may have. They need to be rewired to make them light up but I don't think that will be too hard. The winning idea gets a shout out here. And some KMPO letterhead, since that's the only item we have with our logo on it. Hey, we're a government agency, we can't afford all those fun promotional items that everyone else gives away. Feeling a pain in your wallet? Yeah, we all are. Some of it is due to the price of gas. According to KBOI TV, Idaho is fifth in the country for paying the highest gas prices. Idaho prices are apparently 20 cents more than the national average. Here's the KBOI story. Next week starts Bike to Work Week, and the folks behind it in North Idaho are getting the word out through this public service announcement. Charlie Miller and Monte McCully have done wonderful things for bicycling and walking in the area and continue to do so with BTW Week events. Here is a list of events that will be taking place during Bike To Work Week, as well as information on the Corporate Challenge and other events. Nice work guys. And nice PSA. 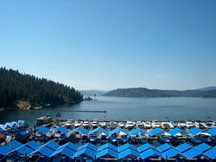 Road construction projects begin this month, or already have, in the City of Coeur d'Alene. City Council members have, for many years now, considered street maintenance and safety a top priority during annual budget talks. Tim Martin, Coeur d'Alene's Street Superintendent, posted this entry to the City of Coeur d'Alene Today blog about street projects coming up this construction season. I made the trek to the west side of Washington State this weekend and am happy to report that, despite warnings from the Washington State Department of Transportation, there were no traffic stoppages on the pass. There were two portions of I90 on Snoqualmie that were reduced to one lane of traffic and the speed limit dropped to 50 miles per hour, but traffic moved smoothly through them. Of course, it was about 9 a.m. when I went through, so not a lot of traffic. The situation might be different at a different time of the day. My brother and his family got trapped on the pass for about three hours one day last summer. My sister-in-law has vowed never to use Snoqualmie again as a result, so we'll see how that works for her. Once I actually got to the west side, I was happy to see that those crazy Olympians are still using their stop signs not just for driving direction but for social commentary as well. Where are these people coming from?? Citylink has outdone itself again, with an increase of ridership on every route in April. This has been happening consistently for months now. Here are the numbers. Congratulations Citylink! Keep getting those folks to work and school and play. 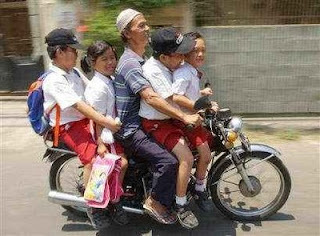 May is Motorcycle Safety Awareness Month, so don't do what the folks in the picture are doing. The Idaho Transportation Department is reminding drivers to be extra alert and cautious to help keep motorcycle riders safe on Idaho highways. Because of their smaller size, motorcycles or scooters are not easily seen and can be hidden in a vehicle's blind spot. ITD offers some tips to help keep motorcyclists safe on Idaho highways. - Always signal your intentions before changing lanes or merging with traffic. - Don't tailgate. Allow more distance when following a motorcycle. Remember that in dry conditions, motorcycles can stop more quickly than cars. - Don't be fooled by a flashing turn signal on a motorcycle - motorcycle signals are often not self-canceling, and riders sometimes forget to turn them off. - Remember that road conditions which are minor annoyances to other vehicles pose major hazards to motorcyclists. 34 motorcycle fatalities occurred in Idaho last year -- an increase from 29 in 2008. The top five contributing circumstances for motorcycle crashes are: failing to yield, inattention, improper turn, following too closely, and alcohol/drug impairment. A couple area streets will be getting new looks this summer. The city of Coeur d'Alene is considering some major changes on 15th Street, including adding bike lanes. That would mean some re-striping and re-configuring of the road.Here are some of the possibilities for 15th Street, from the Coeur d'Alene Press. In Post Falls, Idaho Street will be widened and some features added. Here are the details on that, also from the Coeur d'Alene Press. I heard about this on the radio this morning and looked it up when I got to work. 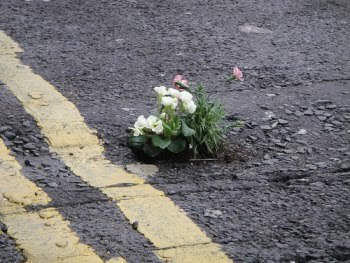 One man is taking on the pothole war- with flowers. I didn't have time to read his entire blog so I'm not sure where this guy is located, but Steve Wheen is planting flowers in potholes, to draw attention to them. He says it spruces up the landscape and lets cars know to avoid them. No word on how the city or county where he lives feels about this. Here's a link to 'The Pothole Gardener's' blog. Volunteers are needed for tree planting along Seltice Way on Saturday, May 8th. The City of Coeur d’Alene, with the assistance of the Centennial Trail Foundation, will be planting 46 trees and 21 shrubs between Seltice Way and the Centennial Trail. The planting will extend from the trailhead parking lot near the intersection of Northwest Boulevard, west approximately 1/3 mile, to the stoplight at Riverstone Drive. Volunteers should be at least 13, and should meet at the trailhead parking lot, near Northwest Boulevard, at 8:30 a.m. The new trees will enhance this transportation corridor by providing a visual and physical separation between motorized vehicle traffic and trail users. Trees will make trail use more pleasant by providing shade and by screening noise, fumes, and dust from the street. The trees are a mixture of native evergreens and deciduous trees. Native trees were selected because they are well-suited to the area. They also provide a sense-of-place to one of the city’s gateways. The deciduous species were chosen for the added shade they provide. The shrub selection is Syringa – Idaho’s state flower. A grant from the Idaho Department of Lands, in cooperation with the Idaho Transportation Department, provided the funding for tree and shrub purchases. One of the westbound travel lanes on Seltice Way will be closed from 7:30 a.m. until the completion of the project, which is expected to be by 12-noon. For more information, please contact Karen Haskew, Urban Forester, at 208- 769-2266. Crews in that area are continuing to work on the I-90 Lake Easton to Bullfrog project and the I-90 Snoqualmie Pass East – Hyak to Keechelus Dam project. · From Monday, May 3, to Thursday, May 6, crews will restrict I-90 to one lane in each direction. · To accommodate weekend traffic volumes, crews will open two lanes in the eastbound direction of I-90, with one lane open in the westbound direction from 9 a.m. Friday, May 7, to 9 a.m. Sunday, May 9. · On Sunday, May 9, from 9 a.m. to 9 p.m., crews will open two lanes in the westbound direction of I-90, with one lane open in the eastbound direction. · Westbound on- and off-ramps of Exit 71 (Easton) are closed until June 15. The eastbound on-ramp at Exit 70 (Sparks Road) is temporarily open to traffic.